Fiery reds, lashings of leather and a contradiction between oversized jackets and translucent tanks created a 70s mood at Margiela. An excess of leather and colour at Margiela, inspired by 70s seduction, nostalgia is ripe – for those who remember the 70s. 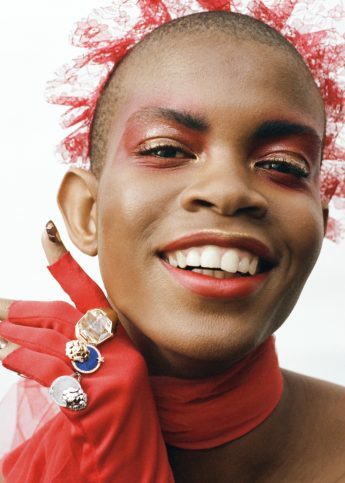 A stunningly eclectic mix of faces on the runway ranged from pretty boys to pretty scary, they create their own characters in the different looks. The painted jacket, vest and floral trousers among violent reds make this a collection to remember. Yet it’s a collection that’s hard to pin down, with an eclectic mix of oversized coats and jackets with tight translucent tops, textures and prints act as points of focal interest. Margiela’s knitwear is bright and striped, whilst metallic jumpers serve a shock to the system. The fashion house has taken an artistic playful take on the staples of the season and it’s definitely worked.